Frida Kahlo’s paintings, and the comparatively small number of photographs that depict her, suggest that her wardrobe was as colorful, intricate, and fabulous as her work. For 50 years, though, there wasn’t much tangible evidence; Diego Rivera locked up her things in a room in their house after her death in 1954, and demanded it not be opened until 15 years after his own death. In 2004, the room was unsealed, like a crypt or a time capsule, and in 2012 the items therein went up on display at her museum in DF and to various exhibits around the world. Now, though, a second kind of curation has emerged, via The Guardian: the photographs of Ishiuchi Miyako, who was allowed to capture the items as they were removed in ‘04. Now on display at London’s Michael Hoppen Gallery, the photos depict close-enough-to-touch detail, and include the items that depict her life in stark day-to-day terms: her prosthetic leg, adorned with a bell; her blood-red Revlon nail polish; her compact, on which she painted with a lit cigarette; one of her full-body casts, attached to a long luxurious skirt and painted with Soviet communism’s hammer and sickle. Her favourite costume, from Tehuantepec, a legendarily matriarchal society in Oaxaca, was a fetching combination of a silk or velvet skirt that finished in a white pleated border, an embroidered huipil and, for fiestas, a pleated and starched ruffle framing the face. As the effects of a traffic accident that Kahlo suffered as a teenager worsened over the years, the long skirts and loose tops of this tehuana dress hid her casts, corsets, braces and thinner right leg, but that was a bonus: She had adopted it originally for political and aesthetic reasons. Ishiuchi Miyako’s images document the traditional Tehuana dresses that both concealed the damage to her lower body and acted as a feminist salute to the matriarchal society from which they are derived. * Through her photographs Ishiuchi came to recognise the parallel between these traditional garments and the kimonos of her own country, an “ephipany” that is evident in the images themselves. Throughout the photographs there is a particular awareness, a tenderness that is inherent to a woman looking through another woman’s intimate possessions. 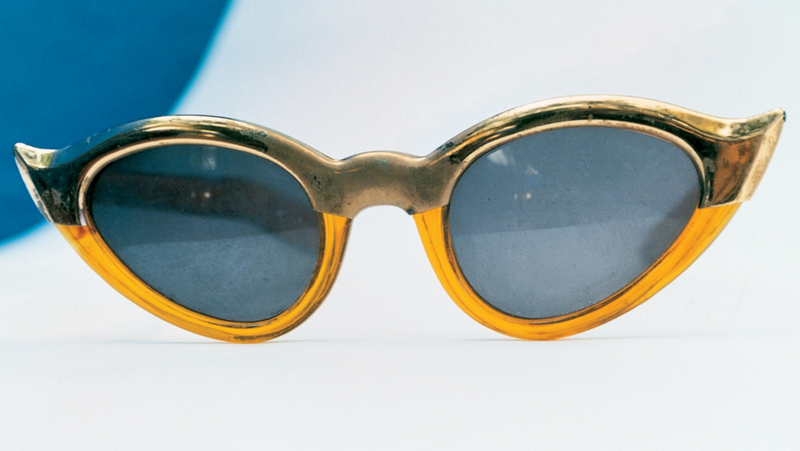 As she painstakingly catalogues the chic of Kahlo’s sunglasses, the intimacy of her darned tights and the corsets that were to be the armature by which she survived. It’s heartening and ideal that another working woman artist was the one to capture such intimate items in Kahlo’s life, after her famously overbearing husband tried to ferret them away—a liberation of the sweetest ilk. Look at more of Kahlo’s sumptuous belongings at The Guardian and Michael Hoppen Gallery.